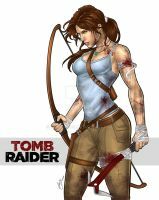 This is my entry for the Tomb Raider Reborn Contest. ommio Dio quanti particolari! Mi piace ogni minima cosa di questo disegno! oh wow, this is just-...WOW! stunning, you really are an amazing artist! Wow, this looks like a winner already; the detail is positively stellar! Good luck to you, I'm confident you'll get into the top 22!